The 7.3-magnitude quake that measures at a depth of 380 miles or 617 km hits the center of the Celebes Sea. It is between the Philippines and Indonesia. The Pacific Tsunami Warning Centre (PTWC) states that there is no tsunami threat because the earthquake is located too deep inside the earth. However, Metro Manila announces that a magnitude-6.7 earthquake manifests in Surigao City. It is also experienced in Sabah. 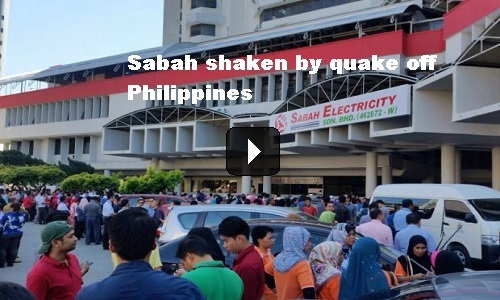 [VIDEO]: KOTA KINABALU: Tremors were felt in the city center here and in Sandakan. That prompts city dwellers to rush out of buildings in panic. People run out of high buildings after tremors are felt in eastern Sabah. It happens after a magnitude 7.3 earthquake strikes the Celebes Sea, off the Philippines. It hit about 466km east of Semporna. Many people account that they are shaking. The tremors are also felt in various parts of the east coast. That include Sandakan and Tawau – as well as in Sabah’s state capital, Kota-Kinabalu. PHIVOLCS Director Renato Solidum explains that the first lesson Metro Manila learns from the quake is how non-engineered buildings pose a greater danger to human life than the quake itself. During earthquakes, skyscrapers are often thought of as the biggest hazards. However, the damages on small to medium-sized buildings, outnumber large buildings in most disasters, just like in Surigao. Solidum estimates that 31,000 people along the West Valley Fault in Metro Manila are affected. This is when a magnitude 7.2 earthquake hit there alone. It is actually higher according to JICA (Japan International Cooperation Agency) study. Their count is 34,000. Around 21,000 people can die as a result. This does not include nearby provinces of Bulacan, Cavite, and Laguna. Those places also lie on the West Valley Fault. Sabah and the Philippines are not only related in historical and geographical terms. Even their fault lines are connected. This somehow indicates that Sabah’s mother country is naturally the Philippines and not Malaysia as claimed by the Filipinos. The Malaysians cannot accept this fact despite their yearly lease payment. Nevertheless, this is nature’s way of keeping the Sabah issue warm for the next DILG Secretary, Bongbong Marcos. 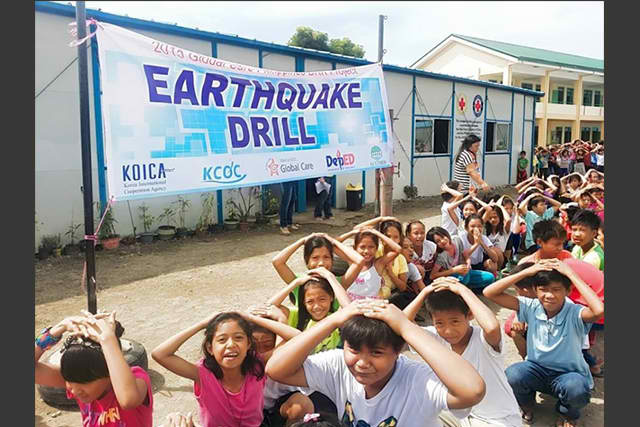 Once the anticipated “Big One” strucks Metro Manila, the first 45-second long siren will signal the start of responses after a magnitude 7.2 quake caused by the movement of the West Valley Fault interceps daily activities – as shown during the recent drill. As traffic was halted, work stopped, and people were instructed to duck, cover, and hold – selected buildings were evacuated. Firemen and rescue teams were seen taking out supposed to be fatality from a burning car. Police arrested people acting as looters in Marikina. This is in response to the 2014 joint report by the Philippine Institute of Volcanology and Seismology and Geoscience Australia disclosing that a magnitude 7.2 earthquake on the West Valley Fault could cause 5,911 buildings and fatalities of about 37,054 Filipinos from greater Metro Manila area, that will not spare parts of Rizal. Chairperson Emerson Carlos said the drill was under the direction of the National Disaster Risk Reduction and Management Council or NDRRMC as reported by CNN Philippines. The North Quadrant practiced evacuation and first aid operations at the Veterans’ Memorial Medical Center.